Losing one of your front teeth can be very frightening. 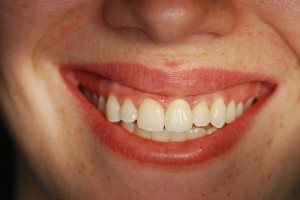 Happily, you can replace that tooth with a dental implant that supports an abutment with a crown. 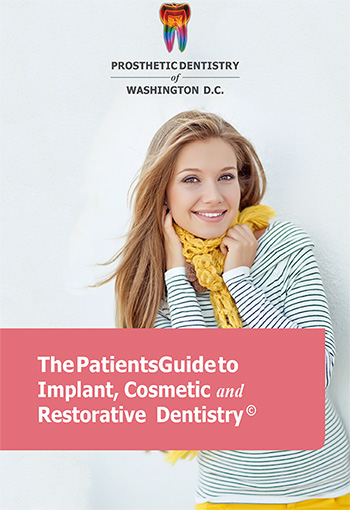 However, for the replacement tooth to be most natural, the implant must be precisely placed at the right angle with the correct depth, and the abutment needs to be custom fabricated in order for you to have the best esthetic result. The crown, itself, must be fabricated with internal coloration and with enough translucency to match to the adjacent teeth. This twenty three year old woman presented to us as a teenager with her maxillary central incisor failing. 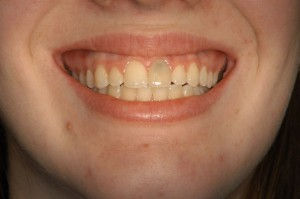 The tooth was replaced with a bone graft and a removable appliance, which provided a temporary replacement tooth. After waiting an appropriate amount of time until she had stopped growing, we inserted the implant, itself, using a special CT Scan generated surgical guide so that it was placed at the right depth and angulation. Her dentition has been rejuvenated. 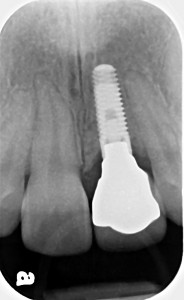 The New Implant Supported Maxillary Central Incisor using a special CT Scan generated surgical guide so that it was placed at the right depth and angulation. Her dentition has been rejuvenated.